More than 50% of all hours allocated at mold shops are primarily dedicated to machining operations only. 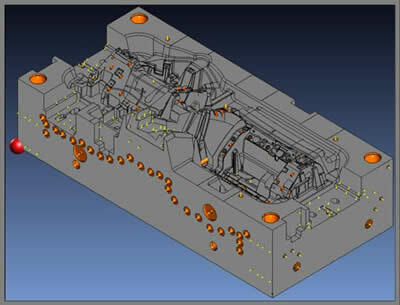 50%-60% of all machining hours are used in 3-D surface machining. The rest of the machining hours are used in 2.5-D operations such as drilling holes for Cooling Lines, Oil Lines, Ejection Systems and machining Slide Pockets, Guide Pin Holes and Pin Locks. The technologies selected by the mold shops and the processes used to implement them define how a shop differentiates itself from its competitors. Machining processes have far reaching affects on Engineering, Mold finishing and Assembly operations. 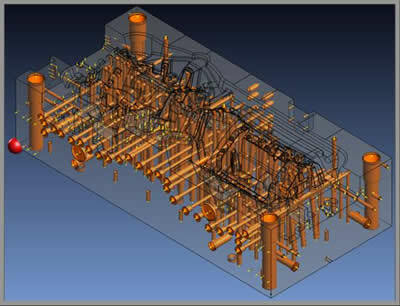 These processes and technologies are our focus.